Upon seeing the new Tchibo Chocolate display at the local Somerfield I couldn’t resist trying out a new chocolate bar. Yes, you read that right, just one bar. I wasn’t feeling especially sophisticated, I was more in the need for a bit of selfish indulgence. I think I chose the perfect bar! 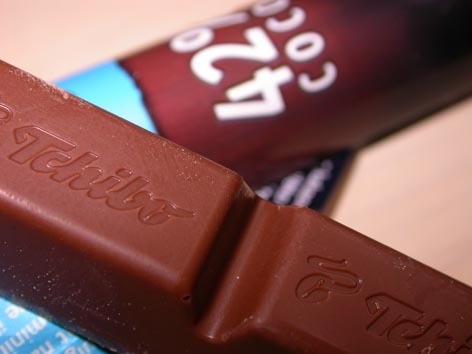 I chose Tchibo San Vicente, full cream milk, 42% cocoa solids chocolate. Before attacking the chocolate I noticed the wrapper states – Sheer chocolate indulgence. So far so good. Made from the finest cocoa from the best regions of Venezuela and formed into a slender bar this chocolate does appear to be rather grown up. Too grown up to put the kids off? Well, I’m not taking any chances. I shall be hiding these beauties at the back of the cupboard. We all do that don’t we? ….Don’t we? Sheer chocolate indulgence? Yes, it certainly does what it says on the wrapper. Comfort eating for grown ups. Contains milk chocolate (42% cocoa solids). OHH MAN! THAT SOUNDS SOOO GOOOOD! I’M GOING TO GO BUY SOME RIGHT AWAY! Toldja it was good, didn’t I? Mmmm, I have just polished off a nice big bar of it. The Canenero Santo Domingo is really good too… 54% chocolat and it has coffee in it!